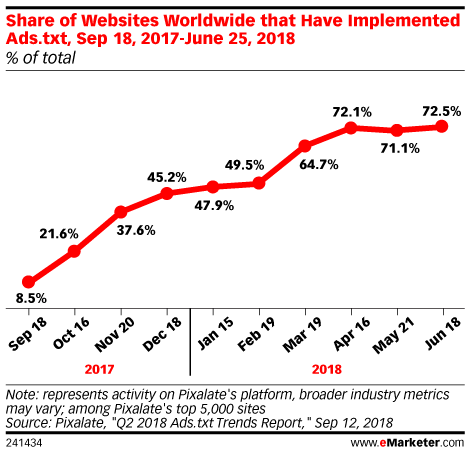 Data is from September 2018 Pixalate "Q2 2018 Ads.txt Trends Report." Data is based on more than 7.5 million domains analyzed utilizing proprietary analytics tools during January 1-June 30, 2018. These domains were measured weekly to identify sites that have ads.txt files implemented. The information is reflective of root domains only, and duplicates were removed from subdomain ads.txt files. Pixalate is a fraud protection and data intelligence platform.